Towering pyramids, Mayan temples, lush waterfalls, thick jungle, fiestas and siestas - everything you’ve heard is true, Mexico is as diverse as it is vibrant, and as atmospheric as it is chilled. 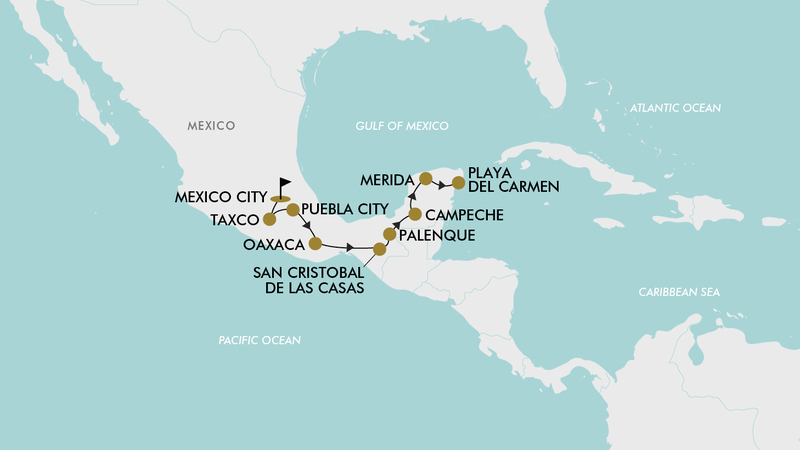 On this 17 day land package you’ll discover the best of Mexico, and then some. Today depart from Sydney, Melbourne, Brisbane, *Adelaide or *Perth for your flight to Mexico City, Mexico (via the USA). Fly with either American Airlines, Delta Airways, United Airlines, or Virgin Australia to name a few (subject to availability). Upon arrival into Mexico City you will be transferred to the hotel. Please note: If departing from Perth your flight may depart the day before (Day 0). This morning you will be picked up from the hotel and enjoy a full day city tour. In the morning you will visit Mexico City’s colonial centre, including the Zocalo, the main square of Mexico City. Here, you will see some important landmarks, such as the National Palace, with its impressive murals of the famous artist Diego Rivera. You will also visit the Templo Mayor, which contains the ruins of the ceremonial centre of the former Aztec capital Tenochtitlan and also see the Metropolitan Cathedral, the biggest Cathedral in Mexico. An architectural masterpiece with both baroque and neo-classical elements, impressive woodcarvings and gold plated alters. Afterwards head to Alameda Park, here you will find the most important cultural building in Mexico City, the Palacio de Bellas Artes (Palace of Fine Arts) where you can view some of the beautiful murals within the palace. From there walk via the beautiful avenue La Reforma to Parque Chapultepec. Here you can find several interesting museums, among them the famous Museum of Anthropology, the largest museum in Mexico. You will be able to enter the Museum of Anthropology (Museo de Antropologia) and view the impressive collection of pre-hispanic artifacts. A must for those who would like to know more about the different cultures of Mexico. This afternoon arrive back at the hotel for an evening at leisure. This morning you will be picked up and taken on a tour to the famous ruins of Teotihuacan, the main highlight for many who visit Mexico City. Teotihuacan is a vast Mexican archaeological complex northeast of Mexico City which rivals the great pyramids of Egypt. Running down the middle of the site, which was once a flourishing pre-Columbian city, is the Avenue of the Dead. It links the Temple of Quetzalcoatl (Temple of the Feathered Serpent), the Pyramid of the Moon and the Pyramid of the Sun, the latter two with panoramic views from their summits. Artefacts in the Museum of Teotihuacan Culture, on-site, include pottery and bone. Enjoy a guided tour of this magical complex and afterwards travel onwards to The Basilica of Our Lady of Guadalupe. A Roman Catholic church, and National shrine of Mexico in the north of Mexico City. The shrine was built near the hill of Tepeyac where Our Lady of Guadalupe is believed to have appeared to Saint Juan Diego Cuauhtlatoatzin. This site is also known as La Villa de Guadalupe or, in a more popular sense, simply La Villa, as it has several churches and related buildings. After the tour arrive back at the hotel for an evening at leisure. This morning travel onwards to Taxco via the small town of Coyoacan. Founded in the seventh century by the Colhua people and later conquered by the Mexica, Coyoacan or the “Place of Coyotes” retains its small-town charm. With its narrow, cobbled streets, colonial churches, vibrant markets, world-class museums and sidewalk cafes, its historic centre is a popular destination for residents and tourists alike. Stop here for a quick break and enjoy a guided walk around the town centre. Afterwards you will head onwards to the colonial city of Taxco, known as the “City of Silver” for the mines that were extracting this precious mineral for decades. Now that the mining has stopped, they are more well known for their silver handicrafts and charming village life. In fact, it’s one of Mexico’s Pueblos Magicos, or “Magical Villages,” which is an initiative by the Mexican government shining a special light on notable places that exhibit natural beauty, cultural riches, or historical relevance. Taxco sits on a hillside, high above sea level and its charming streets are surrounded with views of the surrounding hills and forests. Upon arrival in Taxco, check-in to the hotel and then head out for an introductory city walking tour with a visit to the city centre and main cathedral, Santa Prisca Cathedral. Today you will travel to Puebla with some stops along the way. The first stop being the Pueblo Magico of Tepoztlan, a small yet beautiful and well preserved town. Having been the birthplace of the serpent god of the Aztecs, this town is home to a major indigenous Nahuatl community with some elders still speaking the native language which is quite rare for towns so close to the capital. Enjoy a short walking tour of this beautiful little town and afterwards some time at leisure where you can walk around looking at arts and crafts or visiting the market where, if you dare, try the chapulines – grasshoppers (not included). Afterwards continue to Cholula, a wonderful town that combines history, magic, religion and archaeology. It stands out for having the largest archaeological site of a pyramid (temple) in the New World, as well as the largest pyramid base known to exist in the world today. Here, you will enjoy another short walking tour and visit the amazing pyramid. Afterwards continue onwards to the beautiful colonial city of Puebla and check-in to the hotel for an evening at leisure. Puebla, also known as the City of Angels, was founded in 1531 by the Spaniards and to this day remains a very pleasant town with a rich history. Today it’s a modern and thriving city, but it preserves its colonial charm nevertheless. Its streets are swarming with architectural jewels, many of them covered with the regional Talavera tiles. Churches and convents are witnesses of the past, as Puebla was once an important religious centre. This morning, enjoy a walking tour through the city centre and see the main plaza and cathedral. Afterwards travel onwards to Oaxaca City in the state of Oaxaca in Mexico’s South-West. Upon arrival check-in and enjoy an evening at leisure. Today enjoy a walking tour of Oaxaca’s beautiful city centre. Learn about the history of the city, its architecture and local customs. See Santo Domingo church, the best example of Mexican baroque architecture, then stroll along some of the picturesque streets of the historical centre as you see more of Oaxaca’s landmarks. See the Benito Juarez and 20 de Noviembre markets, and stop at a chocolate factory to see the process of grinding cocoa beans to make Oaxacan chocolate. In the afternoon, visit the ruins of the former Zapotec stronghold Monte Alban in the outskirts of the city and enjoy a guided tour of the area. Monte Albán, site of ruins of an ancient centre of Zapotec and Mixtec culture, located in what is now Oaxaca state, Mexico. The initial construction at the site has been placed at circa 8th century BC. It contains great plazas, truncated pyramids, a court for playing the ball game tlachtli, underground passageways and about 170 tombs, the most elaborate uncovered in the Americas to date. The site is located on high ground, probably chosen for its defensibility. The great plaza atop the highest hill is flanked by four platforms; two temples stand on the platform to the south. After this visit, return to Oaxaca City for an evening at leisure. This morning visit the archaeological site of Mitla and enjoy a short guided tour. Mitla is the second most important archaeological site in the state of Oaxaca and the most important of the Zapotec culture. The name Mitla is derived from the Nahuatl name Mictlan, which was the place of the dead or underworld. Its Zapotec name is Lyobaa, which means “place of rest.” Afterwards travel onwards to Tehuantepec with a quick stop at the gigantic tree of ‘El Tule’ on the way. Upon arrival into Tehuantepec visit a traditional mezcal brewery where you will see how this popular drink is prepared and also enjoy a tasting. Make sure you have some cash on you in case you want to buy this delicious artisan drink to take back home with you. This afternoon/evening check-in to the hotel and enjoy an evening at leisure. After an early start begin the journey to the city of San Cristobal, in the state of Chiapas in the very south of Mexico. Along the way enjoy a stop at the gateway to the magnificent Sumidero Canyon. Sumidero Canyon is a narrow and deep canyon surrounded by a national park and located just north of the city of Tuxtla Gutierrez. Take an optional 2 hour boat ride up the canyon (not included – approx. $15 USD per person). Travellers who do not wish to take the boat trip may stretch their legs and enjoy a lunch break (not included) at one of the nearby restaurants at the port. Afterwards continue onwards to San Cristobal de las Casas, one of the most beautiful cities in all of Mexico. Cobblestone streets, low tiled roofs, colonial architecture and bright painted walls all add to San Cristobal’s special charm. However, it’s not just another colonial town; as this village is located in the Mayan heartland the many indigenous people give it a very special atmosphere. Indigenous culture is everywhere: you can find it in the handicrafts market, in the dresses worn by the people on the streets, or you can live it yourself while visiting one of the Tzotzil Maya communities nearby (not included). Upon arrival check into the hotel for an evening at leisure. Today is free at leisure to explore this beautiful city. This morning travel to the beautiful Agua Azul Waterfall (approx. 4 hours). It has been called by many - the most beautiful natural attraction in Mexico. The Agua Azul Waterfall is in the Blue Water Biosphere of southern Chiapas, just nearby Mexico's famous archaeological park at Palenque. The crystalline blue waters are coloured, in simple terms, by the large amount of limestone deposits on the rocky river bed, a surreal environment in the heart of the dense green rainforest country of southern Mexico. After a visit to the falls, and perhaps a quick dip in the beautiful water (don’t forget your swimwear), travel onwards to the archaeological park of Palenque. Upon arrival in Palenque, check-in to the hotel for an evening at leisure. This morning after breakfast your guide will pick you up from the hotel and take you on an early morning excursion to the Palenque Archaeological zone where you will enjoy a guided tour of this amazing site. Swathed in morning jungle mists and echoing to a dawn chorus of howler monkeys and parrots, the mighty Maya temples of Palenque are deservedly one of the top destinations of Chiapas and one of the best examples of Mayan architecture in all of Mexico. After the visit, travel onwards to the city of Campeche, Mexico’s only walled city, which is on the UNESCO cultural heritage list. Upon arrival check-in and enjoy an evening at leisure. This morning enjoy a short walking tour of the colourful city of Campeche, with a visit to the central plaza and ocean boulevard. Afterwards, travel onwards to the archaeological site of Uxmal, an ancient Mayan city declared part of UNESCO heritage in 1996. Uxmal (pronounced oosh-mahl) is an impressive set of ruins, easily ranking among the top Mayan archaeological sites in the world. It’s a large site with some fascinating structures in good condition and bearing a riot of ornamentation. Enjoy a guided tour of the area, then continue onwards to the city of Merida (dubbed the white city), one of the liveliest cities in the Yucatan Peninsula. As the centre of henequen production (a plant native to Yucatan), Merida gathered great wealth during the last century. This former wealth is still reflected in many of the cities impressive buildings. Upon arrival check-in and enjoy the rest of the day at leisure. Today travel onwards to Chichen Itza, Mexico’s most famous archaeological site. This sacred site was one of the greatest Mayan centres of the Yucatan Peninsula. Throughout its nearly 1,000-year history, different peoples have left their mark on the city. The fusion of Mayan construction techniques with new elements from central Mexico make Chichen Itza one of the most important examples of the Mayan-Toltec civilization in Yucatan. Several buildings have survived, such as the Warriors’ Temple, El Castillo and the circular observatory known as El Caracol. Here enjoy a guided tour of the site, climb El Castillo, check the acoustics of the Ball Court, and wonder about the sacrificed virgins while looking into the Sacred Well. After visiting Chichen Itza, continue to Playa del Carmen where you can enjoy one last night at leisure. Today transfer to Cancun Airport (approx. 45 mins) for your return flight back to Australia. Please note: if your flight departs early, please request a packed breakfast for pick up from the hotel reception the night before. This morning you will be picked up from the hotel and enjoy a full day city tour. In the morning you will visit Mexico City’s colonial centre, including the Zocalo, the main square of Mexico City. Here, you will see some important landmarks, such as the National Palace, with its impressive murals of the famous artist Diego Rivera. You will also visit the Templo Mayor, which contains the ruins of the ceremonial centre of the former Aztec capital Tenochtitlan and also see the Metropolitan Cathedral, the biggest Cathedral in Mexico. An architectural masterpiece with both baroque and neo-classical elements, impressive woodcarvings and gold plated alters. Afterwards head to Alameda Park, here you will find the most important cultural building in Mexico City, the Palacio de Bellas Artes (Palace of Fine Arts) where you can view some of the beautiful murals within the palace. From there walk via the beautiful avenue La Reforma to Parque Chapultepec. Here you can find several interesting museums, among them the famous Museum of Anthropology, the largest museum in Mexico. You will be able to enter the Museum of Anthropology (Museo de Antropologia) and view the impressive collection of pre-hispanic artifacts. A must for those who would like to know more about the different cultures of Mexico. This afternoon arrive back at the hotel for an evening at leisure. This morning you will be picked up and taken on a tour to the famous ruins of Teotihuacan, the main highlight for many who visit Mexico City. Teotihuacan is a vast Mexican archaeological complex northeast of Mexico City which rivals the great pyramids of Egypt. Running down the middle of the site, which was once a flourishing pre-Columbian city, is the Avenue of the Dead. It links the Temple of Quetzalcoatl (Temple of the Feathered Serpent), the Pyramid of the Moon and the Pyramid of the Sun, the latter two with panoramic views from their summits. Artefacts in the Museum of Teotihuacan Culture, on-site, include pottery and bone. Enjoy a guided tour of this magical complex and afterwards travel onwards to The Basilica of Our Lady of Guadalupe. A Roman Catholic church, and National shrine of Mexico in the north of Mexico City. The shrine was built near the hill of Tepeyac where Our Lady of Guadalupe is believed to have appeared to Saint Juan Diego Cuauhtlatoatzin. This site is also known as La Villa de Guadalupe or, in a more popular sense, simply La Villa, as it has several churches and related buildings. After the tour, arrive back at the hotel for an evening at leisure. This morning, travel onwards to Taxco via the small town of Coyoacan. Founded in the seventh century by the Colhua people and later conquered by the Mexica, Coyoacan or the “Place of Coyotes” retains its small-town charm. With its narrow, cobbled streets, colonial churches, vibrant markets, world-class museums and sidewalk cafes, its historic centre is a popular destination for residents and tourists alike. Stop here for a quick break and enjoy a guided walk around the town centre. Afterwards you will head onwards to the colonial city of Taxco, known as the “City of Silver” for the mines that were extracting this precious mineral for decades. Now that the mining has stopped, they are more well known for their silver handicrafts and charming village life. In fact, it’s one of Mexico’s Pueblos Magicos, or “Magical Villages,” which is an initiative by the Mexican government shining a special light on notable places that exhibit natural beauty, cultural riches, or historical relevance. Taxco sits on a hillside, high above sea level and its charming streets are surrounded with views of the surrounding hills and forests. Upon arrival in Taxco, check-in to the hotel and then head out for an introductory city walking tour with a visit to the city centre and main cathedral, Santa Prisca Cathedral. Puebla, also known as the City of Angels, was founded in 1531 by the Spaniards and to this day remains a very pleasant town with a rich history. Today it’s a modern and thriving city, but it preserves its colonial charm nevertheless. Its streets are swarming with architectural jewels, many of them covered with the regional Talavera tiles. Churches and convents are witnesses of the past, as Puebla was once an important religious centre. This morning, enjoy a walking tour through the city centre and see the main plaza and cathedral. Afterwards travel onwards to Oaxaca City in the state of Oaxaca in Mexico’s South-West. Upon arrival, check-in and enjoy an evening at leisure. Today enjoy a walking tour of Oaxaca’s beautiful city centre. Learn about the history of the city, its architecture and local customs. See Santo Domingo church, the best example of Mexican baroque architecture, then stroll along some of the picturesque streets of the historical centre as you see more of Oaxaca’s landmarks. See the Benito Juarez and 20 de Noviembre markets, and stop at a chocolate factory to see the process of grinding cocoa beans to make Oaxacan chocolate. In the afternoon, visit the ruins of the former Zapotec stronghold Monte Alban in the outskirts of the city and enjoy a guided tour of the area. Monte Albán, site of ruins of an ancient centre of Zapotec and Mixtec culture, located in what is now Oaxaca state, Mexico. The initial construction at the site has been placed at circa 8th century BC. It contains great plazas, truncated pyramids, a court for playing the ball game tlachtli, underground passageways and about 170 tombs, the most elaborate uncovered in the Americas to date. The site is located on high ground, probably chosen for its defensibility. The great plaza atop the highest hill is flanked by four platforms; two temples stand on the platform to the south. After this visit, return to Oaxaca City for an evening at leisure. This morning visit the archaeological site of Mitla and enjoy a short guided tour. Mitla is the second most important archaeological site in the state of Oaxaca and the most important of the Zapotec culture. The name Mitla is derived from the Nahuatl name Mictlan, which was the place of the dead or underworld. Its Zapotec name is Lyobaa, which means “place of rest.” Afterwards travel onwards to Tehuantepec with a quick stop at the gigantic tree of ‘El Tule’ on the way. Upon arrival into Tehuantepec visit a traditional mezcal brewery where you will see how this popular drink is prepared and also enjoy a tasting. Make sure you have some cash on you in case you want to buy this delicious artisan drink to take back home with you. This afternoon/evening, check-in to the hotel and enjoy an evening at leisure. After an early start begin the journey to the city of San Cristobal, in the state of Chiapas in the very south of Mexico. Along the way enjoy a stop at the gateway to the magnificent Sumidero Canyon. Sumidero Canyon is a narrow and deep canyon surrounded by a national park and located just north of the city of Tuxtla Gutierrez. Take an optional 2 hour boat ride up the canyon (not included – approx. $15 USD per person). Travellers who do not wish to take the boat trip may stretch their legs and enjoy a lunch break (not included) at one of the nearby restaurants at the port. Afterwards continue onwards to San Cristobal de las Casas, one of the most beautiful cities in all of Mexico. Cobblestone streets, low tiled roofs, colonial architecture and bright painted walls all add to San Cristobal’s special charm. However, it’s not just another colonial town; as this village is located in the Mayan heartland the many indigenous people give it a very special atmosphere. Indigenous culture is everywhere: you can find it in the handicrafts market, in the dresses worn by the people on the streets, or you can live it yourself while visiting one of the Tzotzil Maya communities nearby (not included). Upon arrival check into the hotel for an evening at leisure. Today travel onwards to Chichen Itza, Mexico’s most famous archaeological site. This sacred site was one of the greatest Mayan centres of the Yucatan Peninsula. Throughout its nearly 1,000-year history, different peoples have left their mark on the city. The fusion of Mayan construction techniques with new elements from central Mexico make Chichen Itza one of the most important examples of the Mayan-Toltec civilization in Yucatan. Several buildings have survived, such as the Warriors’ Temple, El Castillo and the circular observatory known as El Caracol. Here enjoy a guided tour of the site, climb El Castillo, check the acoustics of the Ball Court, and wonder about the sacrificed virgins while looking into the Sacred Well. After visiting Chichen Itza, continue to Playa del Carmen where you can enjoy one more night at leisure. Today is free at leisure to explore the beautiful resort town of Playa Del Carmen at leisure, or relax on one of its amazing beaches. Today make your own way to Cancun Airport (approx. 45 mins) for your return flight back to Australia. Please note: if your flight departs early, please request a packed breakfast for pick up from the hotel reception the night before. Travel offer is valid for travel on selected dates until the 12th May 2020. United Airlines, Delta Airlines, Virgin Australia, American Airlines, Air New Zealand, Fiji Airways, Hawaiian Airlines, Korean Air, Cathay Pacific, Aero Mexico plus any codeshare partners (subject to availability). - Black out period applies for flights departing between 14th December 2018 to 19th January 2019, 28th June 2019 to 11th July 2019, 20th September 2019 to 2nd October 2019 and 24th November to 30th November 2019 due to peak season pricing. - Please contact our friendly reservations team to make this booking and provide your preferred travel dates. - This stay behind option is not available through the online check out. - This fee does however include an internal flight from Cancun to Los Angeles. If you wish to forfeit this flight please advise our friendly reservations team so we may secure your return flight back to Australia. Please note, by choosing to forfeit your connecting flight the cost does not change. - If you fail to notify TripADeal that you will not be taking the Cancun to Los Angeles flight with this Stay Behind option, and do not show up for this flight, your entire return flight will be at risk of cancellation by the airline. - Premium Economy (Australia to north America sectors only): Starting from $3999 per person. - Business Class (All sectors): Buy now for $8699 per person. 2 x Single or 1 x Double (subject to availability). Minimum group size 35, maximum group size 48 per vehicle. - Visa fees and requirements (A tourist visa is not required for Mexico but is a strict requirement for the USA if travelling on an Australian passport). - Recommended gratuities/tipping: $3 USD per person per day payable on tour. - Transfer hotel to airport (Day 18, extension package only). Mexico City has a subtropical highland climate, due to its tropical location but high elevation. The average annual temperature varies from 12 to 16°C, depending on the altitude of the borough. Oaxaca has a tropical savannah climate, closely bordering on a humid subtropical climate, due to its high altitude. During the dry season, temperatures during the day remain warm with an average high of 27°C in the coolest month, December, and an average high of 33°C (in April, just before the beginning of the wet season.) Although daytime temperatures are warm, night time temperatures are cool with an average low of 9°C in January. Due to its altitude of 1,555m the climate of Oaxaca is cooler than lowland areas at the same latitude. Mérida features a tropical wet and dry climate. The city lies in the trade wind belt close to the Tropic of Cancer, with the prevailing wind from the east. Mérida's climate is hot and its humidity is moderate to high, depending on the time of year. The average annual high temperature is 33°C, ranging from 28°C in January to 36°C in May, but temperatures often rise above 38°C in the afternoon in this time. Low temperatures range between 18°C in January to 23°C in May and June. It is most often a few degrees hotter in Mérida than in coastal areas due to its inland location and low elevation. Please note: a moderate level of fitness will be required. Travellers must be comfortable walking 1-2 hours at a time on uneven surfaces as there are walking tours included on unpaved tracks, and cobbled streets. If you have any concerns please consult your healthcare provider prior to purchase/travel. Gratuities (tips) are not included in the tour price for services of the tour leader (when available) and driver throughout the tour. The recommended tip for the tour leader and driver is $3 USD per person per day, which will be collected whilst on tour. For stays in Mexico for 180 days or less on an Australian Passport, you won't need a visa. But you'll need to complete a Multiple Immigration Form (FMM) and make sure your passport is stamped by Mexican immigration officials on arrival. If you fail to complete this form or to have your passport stamped upon entry into Mexico, you could be detained and deported. If you enter Mexico by air, you can either complete the FMM in advance online or on arrival. Present your completed FMM for inspection at immigration. Visa and other entry and exit conditions (such as customs and quarantine regulations) can change at short notice. Contact an Embassy or Consulate of Mexico for up-to-date information.